Manchester United face a long, uphill battle to return to the summit of English football but Ole Gunnar Solskjaer has at least got the club back to where they belong in Europe. United have reached the last eight of the Champions League for just the second time since Sir Alex Ferguson’s retirement in 2013. The Red Devils made it to this stage under David Moyes in 2014, falling to Bayern Munich. And while the soon-to-be-sacked Scot (he was dismissed 13 days later) made a decent fist of it against the Bundesliga giants, Solskjaer hopes to go one better and return United to the semi-finals for the first time since 2011. Of course, to do that Solskjaer must transcend his PSG scalp and mastermind the downfall of the side who beat United in the final that year: Barcelona. The Norwegian is set to welcome back Marcus Rashford. The 21-year-old was absent for United’s defeat to Wolves last week due to an ankle problem but should feature on Wednesday evening. Ander Herrera is also due to return after also missing last week’s trip to Molineux. And while they are important players for Solskjaer, Luke Shaw will play a major role in the outcome of this tie. The 23-year-old left-back is braced for the challenge of his career as he prepares to go up against Lionel Messi while he could prove an asset if United play on the counter-attack. 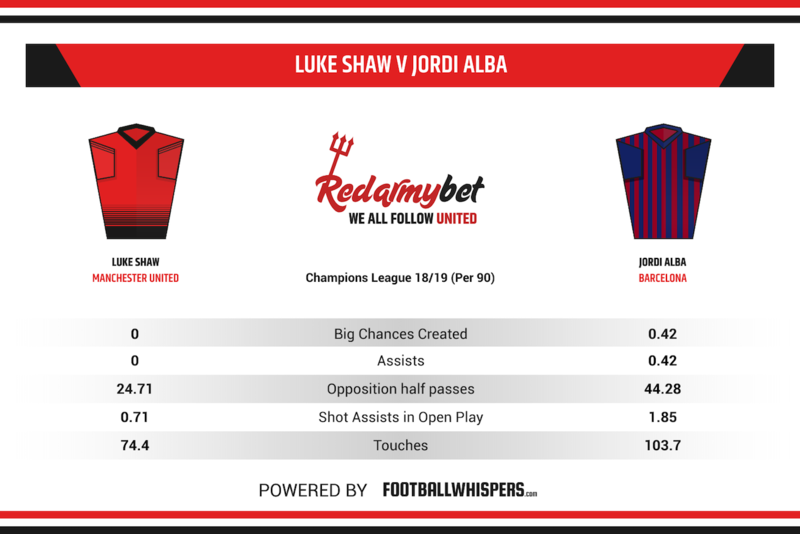 Potentially influential at both ends of the pitch, we’ve decided to put Shaw under the RedArmyBet spotlight, pitting him against Barca left-back Jordi Alba. Shaw has enjoyed a fine season. After initially struggling to convince Jose Mourinho of his first-team credentials, the eight-time England international nailed down a place in the Portuguese coach’s starting XI and kept it following Solskjaer’s arrival. He has started 26 Premier League games this term, his best return since the 2013/14 campaign, his last at Southampton before moving to Old Trafford for £30million. There have been clear improvements in his game, too. Shaw failed to create a big chance last season but has fashioned five in the current campaign. His passing accuracy is slightly down, from 84.9 to 83.7 per cent, but he is attempting and completing more forward passes, a measure of his confidence going forward. The former Saints youth starlet has increased his open-play xContribution (xA + xG) per 90, while his influence was clear to see as he notched assists in recent outings against Wolves and Watford. His run and cross for Romelu Lukaku’s goal in the defeat of Crystal Palace encapsulated everything great about Shaw; his driving run took four Eagles defenders out of the game before his pinpoint cross made it impossible for the Belgian striker to miss. Shaw’s defensive output has also improved. He is winning the ball with greater frequency in the defensive third and his return of 37 interceptions in all competitions portrays his sharpened reading of the game. Indeed, several of United’s attacks this season have been triggered by Shaw breaking up the opponent’s play and exchanging a crisp one-two with a teammate before embarking on a driving run. There are still things to work on, of course. His involvement in Diogo Jota’s goal as Wolves knocked United out of the FA Cup hinted at indecision. There will be no margin for error on Wednesday, with Messi, Luis Suarez and potentially Ousmane Dembele (if he recovers from injury in time) lurking. Perhaps Shaw can study Alba. The 30-year-old, who was named in the 2015 Champions League Team of the Season, is a veteran of these knockout games at this stage. A staple of the Barca defence since joining from Valencia in 2012, it’s difficult to believe Alba is without a Champions League winners medal. And this season he has played like a man determined to put that right. In La Liga this season, no defender can match his eight assists or 12 big chances created. He has a total of 33 shot assists in open play while he has completed more through balls than any player in his position with nine. Unsurprisingly, he ranks first in expected goals assisted per 90 and open-play xContribution (xA + xG) per 90. The Spain international’s latest assist helped Barca virtually wrap up the title race, teeing up Suarez’s opener against Atletico Madrid as the champions opened up an 11-point gap with seven games remaining. He’s been equally as effective in Europe, too, with one goal and three assists this season. Quick, intelligent and solid defensively, Alba is the complete left-back. He also boasts a wonderful understanding with Messi, knowing when the Argentine will dart into space. It’s a combination that has brought Barcelona dozens of goals down the years. Simply put, United will need maximum concentration, skill and bravery to shut them down on Wednesday. Shaw won’t come into contact with Alba too often but the United man will certainly be responsible for keeping tabs on the five-time Ballon d’Or winner.